With a body of work that includes the guitar case rocket-launcher in Desperado and the motorized vampire-staker in From Dusk til Dawn, it's obvious that director Robert Rodriguez knows a thing or two about crafting amazing weapons that don't really exist (although I wish they did). But now he's turning to the denizens of the Internet for help with his latest project. He wants you to tweet him your ideas for the ultimate badass monster-slaying weapon @Rodriguez using the hashtag #KeepMoving (you have until April 10). If he likes your devastating device, it could be created in CG and be featured in the final version of Two Scoops, the upcoming Project Green Screen film he's making in conjunction with BlackBerry — and you'll be able to tell your mother that all those days spent playing videogames and watching sci-fi and horror movies has finally paid off. To help you get your El Wray on, here are five weapons that don't actually exist, but should,presented in descending order of awesomeness. What appears to be a simple trio of waffle cone dispensers is in fact a piece of super-destructive weaponry guaranteed to obliterate even the most obstinate of beasts. The Waffle Cone Rocket Launcher unites three separate tubes packed with waffle cone-shaped projectiles. The catch is that these bad boys aren't packing two scoops of soft serve — they're loaded with the latest missile guidance technology and a warhead that detonates on impact. If the initial blast doesn't get them, then the rainbow-sprinkle shrapnel embedded in each cone should help finish the job, brightening your day in the process. That's a win-win. When it comes to pure stopping power in melee combat, the two-handed battle-axe has been one of the finest options since the Middle Ages. The only problem is it's not something you can swing over your head for hours on end, unless you are some hulking Kurgan-esque warrior with arms of iron. Luckily, in our hypothetical future, no one has to worry about that. Thanks to the latest in plasma technology (not the kind used for televisions), it's possible to eliminate the thick double-edged blades in favor of two new, super-hot plasma edges — allowing any monster hunter to swing the big stick regardless of arm size. The dual blades act as thermal knives, reaching a temperature of over 3,000 degrees Celsius, capable of cutting through even the thickest dragon hide while instantly cauterizing every bit of flesh in their wake. This killer weapon is also easily concealable, thanks to a telescoping shaft. You can practically carry it in your pocket when Hell's minions give you the day off. If you love the smell of burning monster flesh in the morning, this weapon was made for you. Vae Victis, indeed. Anyone who's ever played Capcom's classic Street Fighter 2 is probably familiar with military tough guy Guile. His signature move is the "sonic boom," where he waves his arm and fires off a whirling dervish of sound that beelines toward his opponent. That's cool and all, but it would be cooler if it was possible to achieve the same effect by using an actual weapon, right? That's where the Sonic Scythe comes in. This two-handed weapon works as a fully functional scythe, but with an added effect: it can store ambient sound that can then be unleashed as a devastating attack capable of shattering bones and bringing even the most monstrous behemoths to their knees, where they can pray for mercy that is in no way forthcoming. Use it as an offensive weapon by aiming a direct-line blast at your target or swing the scythe in a circle to create some breathing room when surrounded by hordes of enemies. Every monster hunter needs something supernatural at their disposal — and in that spirit, I give you the Severed Heads on a Chain. It's basically a gory updating of a chain whip (thinkCastlevania meets The Walking Dead). Instead of a traditional tip, this weapon would allow you to string the severed heads of your vanquished foes onto a 10-foot titanium chain while the slavering skulls keep chomping as if they still had a gut to fill. Imagine the look on your opponent's face when a gaggle of zombified monster noggins whip through the air and coil themselves around the brute for a grisly attack. Plus, it makes for an intimidating fashion accessory when worn draped around the torso (bandoliers are so passe). Just be sure to feed them frequently so you don't become the next snack. When you absolutely, positively, have to send every monster in the area straight back to the bowels of Hades, accept no substitute for this high-powered piece of ordnance. This weapon is the byproduct of a meeting between Vatican exorcists and a group of unemployed Soviet Quantum Physicists — the holy and secular allied in a singular goal: putting evil back in its place. This is the nuclear option in any monster showdown. The last resort. As Peter Parker's uncle Ben was fond of saying, "with great power comes great responsibility." That's particularly true with this gun, which sports a futuristic shell housing a mini-reactor capable of creating inter-dimensional rifts. Firing the gun (which is roughly the length of a sawed-off shotgun, but significantly thicker to properly house the reactor) requires huge amounts of energy, and the ensuing rip in the space-time continuum exerts an extreme gravitational pull — meaning everything in the direct vicinity of the launched portal will be given a one-way ticket direct to Hell. Monsters, mothers-in-law, IRS agents...everything goes. Every shot has to count, but there's no denying the weapon is the final word in monster annihilation. And there you have it — five totally bizarre weapons I wish were real. Now it's time for you to hit the drawing board and come up with some of your own ideas. Find out more about Project Green Screen here, including other ways to participate, then tweet @Rodriguez with your idea and the hashtag #KeepMoving to submit your awesome weapon idea and it could end up in the actual film. You have until April 10 to enter! Need some inspiration? Listen to the man himself talk about that very concept. Mike Bracken is a staff writer at Movies.com and videogame reviewer for GameCritics.com. He spent two seasons as the Horror Geek on Comedy Central's Beat the Geeks. 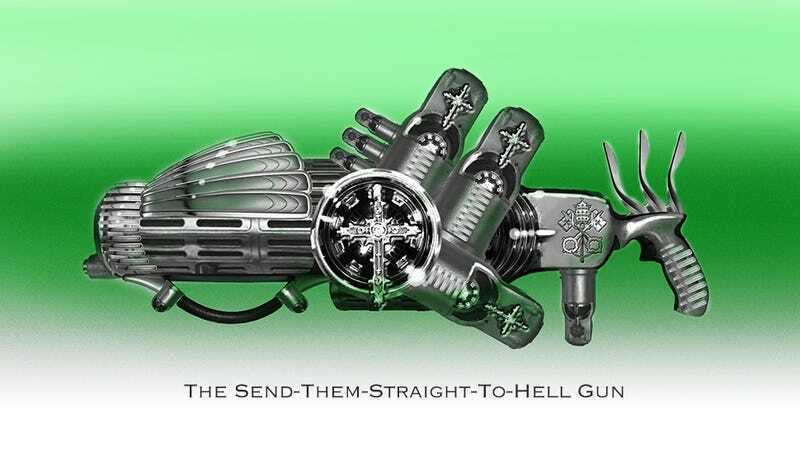 "Send-Them-Straight-to-Hell" gun image created by Josh Henson.